How Do Our Tankless Water Heaters Work? Chronomite tankless water heaters are a low-cost opportunity for energy savings that produces a return in utility, maintenance, and material costs. They require only a cold water line and electrical hookup – no need for costly piping/valving associated with conventional tank heaters. The element assembly houses a series of ingeniously designed coils that instantly heat water as it flows through the vessel. A unique power switch automatically applies electrical current to the coils when hot water is requested. The electrical current is not applied when water is not in use. The microprocessor can be preset at the factory to maintain a constant output temperature, even at varying flow rates of the unit. The flow-through abrasive action of water through the element assembly creates a self-cleaning feature that prevents alkali and calcification buildup, reducing the risks of corrosion and flooding; reducing maintenance and operational costs; and ensuring a longer system life. An electrical connection and cold water line—that’s all Chronomite needs to make it hot. The compact, easy-to install unit provides endless solutions to projects involving limited space and access. At the size of a standard dictionary, Chronomite tankless water heaters are well hidden for aesthetic appeal, and easily placed within a specially designed compartment underneath wash systems and hand basins. 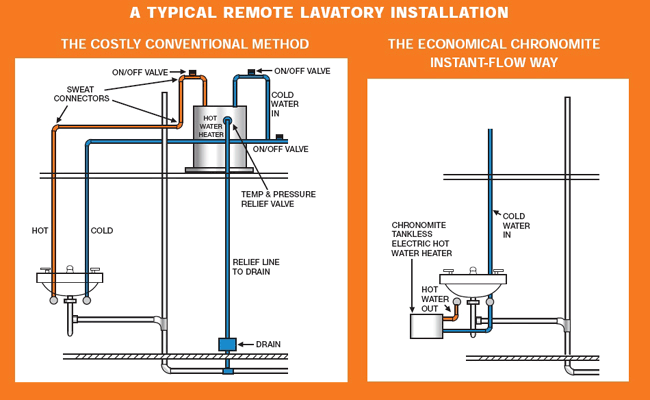 Using only a cold water line and electrical hookup, installation costs are minimal, and there is no need for a costly piping/valving associated with conventional water heaters (see diagram below).